Broadway is a major thoroughfare in central Los Angeles and Los Angeles County, southern California. The Broadway Theater District in Downtown Los Angeles is the first and largest historic theater and cinema district listed on the National Register of Historic Places. Broadway begins at Main Street just north of the San Diego Freeway (Interstate 405). From there it runs 10 miles (16 km) north from South Los Angeles to Downtown, connecting Carson, Rosewood, and Athens. 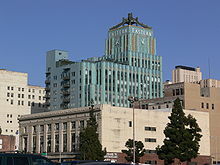 After entering Downtown, it passes through Broadway's historic commercial district and theatre district, then enters the Los Angeles Civic Center and passes through Grand Park. After crossing the Hollywood Freeway (US 101) and Cesar Chavez Avenue, signs along the street change to read "North Broadway" as it enters Chinatown and then passes through the Dragon Gate and Central Plaza. It then curves northeast, passing through the old railyards north of Downtown Los Angeles. After crossing the Golden State Freeway (Interstate 5) it heads due east to its terminus at Mission Road in Lincoln Heights. Broadway is one of the oldest streets in the city, it was laid out as part of the 1849 plan of Los Angeles made by Lieutenant Edward Ord and named Fort Street. Fort Street began at the south side of Fort Moore Hill (a block north of Temple Street) at Sand Street (later California Street). In 1890, the name of Fort Street, from 1st Street to 10th Street, was changed to Broadway. The rest of Fort Street, from California Street to 1st Street, was changed to North Broadway. Proposal for opening Broadway through to Buena Vista Street (now North Broadway), and extending the street south into what was then part of Main Street, below Tenth Street, in order to give a continuous, wide thoroughfare from the southern city limits to the Eastside, was made as early as February 1891. The Broadway Tunnel under Fort Moore Hill was opened in 1901, extending North Broadway to Buena Vista Street at Bellevue Avenue (later Sunset Boulevard, now Cesar Chavez Avenue). A section of Broadway in South Los Angeles was originally named Moneta Avenue until 1923. In 1909, construction on a bridge across the Los Angeles River was begun to connect Buena Vista Street to Downey Avenue, which ran from the river to Mission Road. The names of Buena Vista and Downey were then changed to North Broadway, but not without significant objections from affected residents and landowners. The bridge, which continued to be referred to as the Buena Vista Street Bridge for a good while, was opened to traffic in late September 1911. For more than 50 years, Broadway from 1st Street to Olympic Boulevard was the main commercial street of Los Angeles, and one of its premier theater and movie palace districts as well. It contains a vast number of historic buildings and is listed on the National Register of Historic Places. Before World War II, Broadway was considered by many to be the center of the city, where residents went to ornate movie palaces and live theaters, and shopped at major department stores and shops. Some historically significant buildings include the Bradbury Building, Ace Hotel Los Angeles, and the Los Angeles Examiner building designed by Julia Morgan. Some of the movie theaters on the street fell into disuse and disrepair, some were replaced with parking lots, but many have been repurposed and/or restored. The department stores closed in the 1970s and 1980s, but Broadway has been the premier shopping destination for working class Latinos for decades. The Downtown's real estate revitalization, using the City's adaptive reuse ordinance that makes it easier for developers to convert outmoded and/or vacant office and commercial buildings into residential buildings, has reached the Broadway Historic District. It includes the transformation of the United Artists Theater office tower into the Ace Hotel Los Angeles, and restoration of its movie palace. The Bringing Back Broadway commission is working on further reviving the landmark Los Angeles boulevard in the historic district. Led by City Councilman Jose Huizar, the commission has recommended widening sidewalks, eliminating traffic lanes, constructing new parking structures, and bringing back streetcar service reminiscent of the street's past. A pedestrian-friendly project finished up in December 2014 that widened the sidewalks and replaced the parking lane with planters, chairs and round cafe tables with bright-red umbrellas. The Great Streets Initiative seeks to bolster the street-level health of the city by making several dozen boulevards more hospitable to pedestrians, cyclists and small businesses. Mayor Eric Garcetti said the effort represents "a shift from the way that our neighborhoods have been planned in Los Angeles," with a new focus on "walkability and transit." Between Third Street and Olympic Boulevard are a dozen historic theaters known as the Broadway Theater District—the largest surviving collection of pre-WWII movie palaces in the United States, including the 1918 Million Dollar Theater, the first Los Angeles movie palace built by Sid Grauman, the 1931 Los Angeles Theatre and the 1926 Orpheum Theatre. The Eastern Columbia Building: the Entrance to the Historic Core and the "Jewel of Downtown"
East Gate — of New Chinatown. Little Joe's site — demolished. Historic Broadway station is an under-construction light rail subway station in the Los Angeles County Metro Rail system. The station is located near the intersection of 2nd Street and Broadway  The station is directly across the street from the Los Angeles Times Building, and is a block from the historic Broadway Theater District. Will be serviced by the North/South route Blue Line and the East/West route Gold Line. Metro Local lines 2, 4, 30, 40, 45 and 330 operate on Broadway, as well as Metro Rapid line 745. Most of those only serve Broadway in Downtown, but Line 45 serves the majority of Broadway from Lincoln Heights southwards. Line 745 serves Broadway from Cesar Chavez Avenue, through Downtown, to the Imperial Highway. The Harbor Transitway is located in the median of the Harbor Freeway (Interstate 110), running between South Broadway South Figueroa Street from South Los Angeles to the Harbor Gateway Transit Center near Long Beach. Other Metro bus lines, and other transit agencies' bus routes also operate on the Harbor Transitway, and/or have street level transfer connections at the Metro stations. ^ "City In Brief". Los Angeles Times. September 6, 1889. p. 8. (Subscription required (help)). Cite uses deprecated parameter |subscription= (help) Alternate Link via ProQuest. ^ "No Title". Los Angeles Times. February 18, 1890. p. 4. (Subscription required (help)). Cite uses deprecated parameter |subscription= (help) Alternate Link via ProQuest. ^ "Sou', Sou'west". Los Angeles Times. February 26, 1891. p. 4. (Subscription required (help)). Cite uses deprecated parameter |subscription= (help) Alternate Link via ProQuest. ^ "Realtors Want New Boulevard: Ask Supervisors for Route Connecting Moneta Avenue With Harbor". Los Angeles Times. December 10, 1922. p. V9. (Subscription required (help)). Cite uses deprecated parameter |subscription= (help) Alternate Link via ProQuest. ^ "A Literary Fog". Los Angeles Times. November 30, 1909. p. II4. (Subscription required (help)). Cite uses deprecated parameter |subscription= (help) Alternate Link via ProQuest. ^ "The Lancer". Los Angeles Times. January 22, 1911. p. II5. (Subscription required (help)). Cite uses deprecated parameter |subscription= (help) Alternate Link via ProQuest. ^ "Downey And Buena Vista Will Be North Broadway". Los Angeles Herald. 35 (353). September 19, 1908 – via California Digital Newspaper Collection. ^ "Object to Changing Name". Los Angeles Herald. 32 (105). January 14, 1905 – via California Digital Newspaper Collection. ^ "Buena Vista Street Will Continue Name: Will Not Be Changed to North Broadway". Los Angeles Herald. 32 (238). May 27, 1905 – via California Digital Newspaper Collection. ^ "Object to Merger Of Downey Avenue". Los Angeles Herald. 36 (24). October 25, 1908 – via California Digital Newspaper Collection. ^ "East Side Residents, Prefer Downey Avenue". Los Angeles Herald. 37 (200). April 19, 1910 – via California Digital Newspaper Collection. ^ "Majestic; Great Viaduct About Ready; Cars Run Over the Buena Vista Structure; Concrete Bridge Across Los Angeles River Weighs Nearly Forty Thousand Tons, Cost Two Hundred and Seventy-five Thousand Dollars—Without a Peer in West". Los Angeles Times. September 24, 1911. p. II1. (Subscription required (help)). Cite uses deprecated parameter |subscription= (help) Alternate Link via ProQuest. ^ a b DiMassa, Cara & Bloomekatz, Ari B. (January 28, 2008). "L.A. plans Broadway face-lift". Los Angeles Times. pp. B1, B8. ^ "Bringing Back Broadway". City of Los Angeles. ^ Hawthorne, Christopher (December 6, 2014). "'Latino Urbanism' influences a Los Angeles in flux". Los Angeles Times. ^ Geffner, David (January–February 2008). "Screen Gems". Westways. 100 (1). Automobile Club of Southern California. pp. 62–65. ISSN 0043-4434. OCLC 8439424. 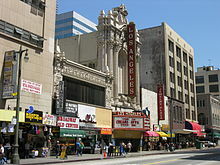 Wikimedia Commons has media related to Broadway (Los Angeles). This page was last edited on 18 January 2019, at 19:10 (UTC).